A method for making hydrogen from methane without emitting carbon dioxide could be a new route to a sustainable future for fossil fuels. Chemists and engineers at the University of California Santa Barbara (UCSB) in the US bubble methane through a molten bismuth–nickel catalyst, converting 95% of the gas into graphite and hydrogen. 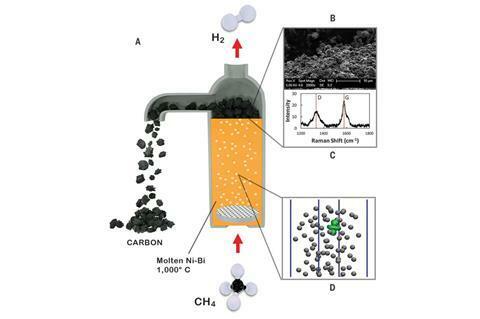 Previous attempts to develop cleaner methods for making hydrogen from methane have failed because solid catalysts got ‘coked’, covered by carbon layers that stopped them working. One alternative method used molten tin as a catalyst, in which only a limited amount of carbon can dissolve, with the rest precipitating out at the top, avoiding coking. But although tin melts easily the catalyst didn’t make enough hydrogen. 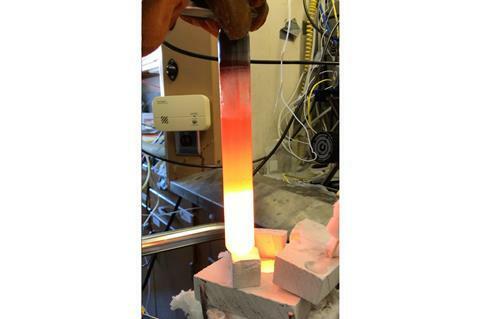 ‘Our first reaction when we heard this is, “Well, we’ve got to put some nickel in to activate the melt,”’ Metiu tells Chemistry World. The UCSB team – with most of the experiments done in Eric McFarland’s lab by PhD student Ches Upham – used quartz tubes to contain the metals and methane. The researchers heated a mixture of nickel and bismuth to 1065˚C and bubbled through 10cm3 of methane per minute. Conversion to hydrogen was almost complete, and Metiu stresses no carbon dioxide was produced. However, the energy required for heating would generate emissions unless powered entirely by renewable sources. Beatriz Fidalgo from Cranfield University, UK, calls the approach to avoiding coking ‘interesting’ and likes the reactor’s simplicity. It’s hard to see how it would fit in our existing energy infrastructure, she adds, although it ‘could be a useful method for converting solar energy into chemical energy’. McFarland has analysed the economics of scaling up this very early result to producing 180,000 tonnes of hydrogen per year. That would need a 620m3 reactor, around a quarter the size of an Olympic swimming pool. The UCSB team is collaborating with Shell, and both think the technology may be viable on that scale. There is now an ‘ongoing conversation’ about its development, Metiu says.